Engraved Dog Tags for Pets with Name and Phone Number you can order for € 9,95 free shipping at Superpipapo´s. Click and go directly to our shop or read on! All exclusive and original engraved dog tags for pets, like mostly dogs and cats, are handmade by us out of olive wood from the Spanish countryside. The tags come with individual engraving of the name of your pet and a phone number. Watch out: the tags are available in several sizes, and the smallest are suitable for cats and small dogs! 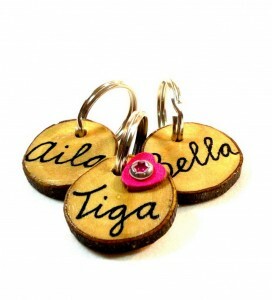 Engraved Dog Tags for Pets with Name and Phone Number – Original Handmade Quality from Olivewood made for Your Dog or Cat! Superpipapo thought of doing something more original than the good old same engraved dog tags and cats tags offered in aluminum. The idea was born simply. Since the workshop of Superpipapo in Spain, it was logical to produce original exclusive engraved dog tags and cat tags with individual engraving made from olive wood. It is basically simple! First an olive wooden small disc is sawn. Then the name of your dog or cat is written with a laser on it, and if you like a phone number. Previously, these were engraved by hand, but the wood is too hard and the result with the laser is much nicer. We ensure that all our customers agree! For the finishing of two strong varnish layers are applied. Our engraved dog tags for pets with name and phone number are delivered and secured to the collar with a double ring of stainless steel (Inox). And there it is: something super unique especially made for your pet: a unique, natural and light product! When you order one or more engraved cat or dog tags, be aware that your order may take a day or two longer. It simply needs some time to make and finish the tags. You can choose from several designs. The decorations in several colors, like flowers, hearts and rounds, are made of leather and are studded into the tag. You can leave the information in an open field before paying or using the contact form. We hope to be receiving your order! Read why to buy a tag!